Azolla plant surface. 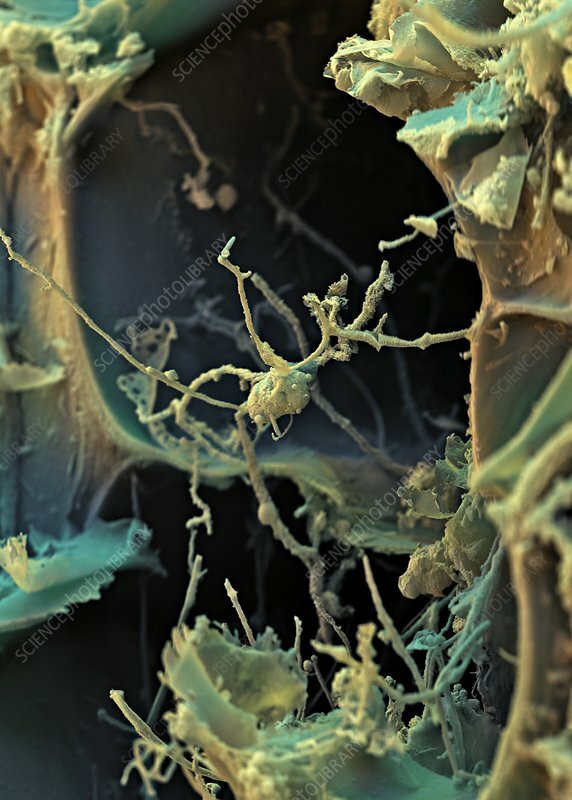 Coloured scanning electron micrograph (SEM) of the surface of an Azolla (water fern) plant. This plant has a symbiotic relationship with Anabaena cyanobacteria, where the cyanobacteria doubles the rate of photosynthesis and fulfils the nitrogen requirements of the plant. Both these factors give the water fern a competitive advantage over other water plants, a factor spotted by the Chinese 2000 years ago. The Anabaena-Azolla association is used as a green manure for rice crops. Anabaena is a filamentous organism, which, apart from vegetative cells, forms heterocysts and akinetes.